One of the things which has made Mobile Suit Gundam: The One Year War so popular with fans from its initial broadcast to today is the sort of moral and social ambiguity which hung on the narrative and sometimes made it hard for viewers to easily delineate the good and bad in the story. From the initial concept, represented in a rebellion by an over-taxed Spacenoid population (shades of 1776, of course) to the very climax, the series presented characters and situations on both sides with whom the audience could empathize readily, if not comfortably at some times. Some of these choices are very subtle and apt. On the one hand, the ‘good’ guys of the Federation, dressed and equipped as if they were the US Military in space (even led by a figure who appears as the reincarnation of Bobby Lee, in the form of General Revill) open the series with a series of reprehensible actions, including being the first to deploy nuclear weapons against civilian colonies. This is countered by the obviously Prussian/German inspired Principality of Zeon, whose own war outrages (such as the Operation British Colony drop) and deployment of the Mobile Suit ‘wonder weapons’ contrasts with the naturally sympathetic position of being the underdog facing down a heavy-handed, tyrannical government. This ambiguity was not absolute, however. There were certainly figures on both sides whose goals were clear, and whose affiliations were not in doubt. For example, the Zabi family provided the necessary ‘absolute evil’ against which the viewers could range their emotions no matter the situation. However, whilst these rulers of Zeon were centered as the main antagonists of the series, almost every other main character has conflicting emotions to them. Indeed, even aboard the White Base, the crew of which are our main window into the world of the One Year War, we have a series of characters that is seemingly fraught with conflicting emotions and aims. For example – AND BE HONEST – is there a single UC fan who has not wanted to slap Amuro silly? I myself just wanted to torch the little bugger and beat out the flames with a motorbike. This is intentional, of course… And it works very well. The White Base, with its conscripts, impressed civilians, and even children represents the totality of war and brutalization which conflict inflicts upon those who have to live through such times. Amuro resists and complains but eventually grows not only to ‘do what needs to be done’, but also into the realization that both sides in the conflict are basically in the wrong, to one degree or another. The same can be said for the rest of the crew. Hayato is just another child drawn into the war. The same is true for the cynical Kai, kind-hearted Fraw, noble Mirai and the ‘Munckins‘ of the ship. Even the young officer Bright Noa is conflicted about both the legitimacy of the war, and his duty to command the infamous ‘trojan horse of fools’ mission. The Red Comet, or the Red Baron 2.0? 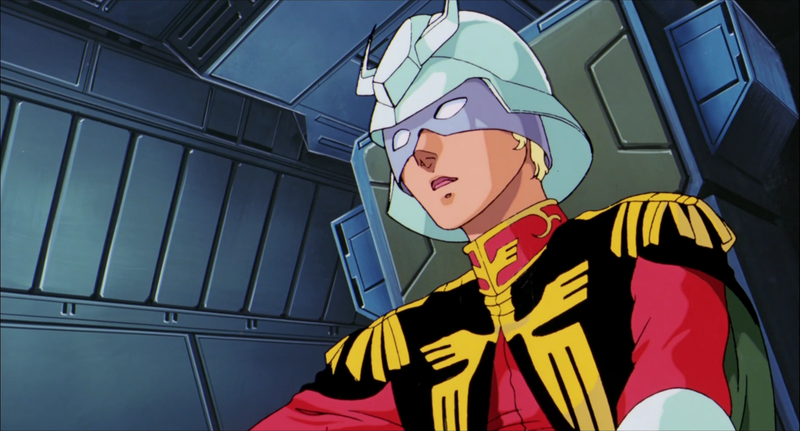 Char is presented to the audience as the archetypal warrior elite, even from the very first episode of the 0079 TV series, with his rational mindset, concern for his troops, and a familiarity with the Zeon chain of command which marks him as a power in the principality. This setup throws the audience slightly as, though Char certainly attempts to throw spanners in the works at every opportunity – indeed, even coming to see the defeat of the RX78 as a personal matter – his deeper goals, revealed in him engineering the death of his old school friend Garma, lie in different directions. Broken by the murder of his father as a child, Char/Casval bides his time, and uses the war as the final pretext to both avenge the murder – by slaughtering all the Zabis themselves – and then leading the Principality of Zeon in what he sees as Daikun’s old plan for the independence of the Colonies. This mixing of traditional military aesthetics with a more complex social/political agenda made Char the most popular of the characters in the series, with Tomino giving him more screen time, more relationships, and more general appeal than even Amuro to some degree. This I see as intentional, and intentionally disturbing – in that whilst Char certainly appears to be a sympathetic character to some degree, fondness for him comes with the sort of emotional baggage which would have Sigmund Freud spinning like mad in his mother’s grave. Tomino’s inspiration for this unusual character was the German fighter ace Manfred Von Richthofen, the famed Red Baron, who led the German air wing, The Flying Circus, until his death in 1918. Manfred – the Red Baron – is one of the most outrageous and impressive military figures in history, and whose life might well have been written by Joseph Campbell himself, so closely does he fit with the concepts of the Hero’s Journey, as presented in the famed Monomyth. He was an aristocratic Silesian whose childhood was dominated by the hunt, the importance of bloodlines, a developing sense of German National identity and above all else the rules of war, as handed down to him by generations of noble ancestors. Joining the Prussian cadets at the age of 12, Manfred first joined the elite Uhlans in 1911 and rode to rather unreasonable distinction in the East, according to his own writing – in that the war quickly stagnated into the horrors of mechanized warfare, denying the idealistic Manfred the ability to ride to glory, as his ancestry required. Things became even more dire for the young man when he was moved to the mud of the Western Front, which had been ruined by shot and shell, and to add insult to injury, his noble young mad was assigned to the quartermaster’s corp, which saw him safely in the rear delivering supplies. Not something a hot blooded young warrior could tolerate. Indeed, he even went as far as writing the the Kaiser himself, suggesting that such a posting was not what he had been raised for, and requesting transfer to an aerial unit, in which Manfred felt resided the last vestiges of the feudal military ideals of old. Manfred was granted his request in 1915, and after flying as both observer and gunner, he entered the company of Oswald Boelcke, who understood that Manfred had a real desire to take the war into air properly, and that the younger man’s vigour should not be wasted. Though Boelcke had over 40 kills to his name by the time he took Mafred under his wing, he knew that the average life expectancy of a fresh pilot was 14 days, as the learning curve on the string-bag aircraft of the age was not so much steep as it was mountainous. The young man proved an excellent pilot, a master of even the most idiosyncratic aircraft and, above all other considerations, a gentleman in the air. Perhaps because of the nature of the air war, many pilots on both sides considered they were above the mud-and-blood murder machine down below – a thing which was made worse by the way in which both sides sold their ace pilots as recognizable heroes to the home front. It would have turned even the strongest mind. 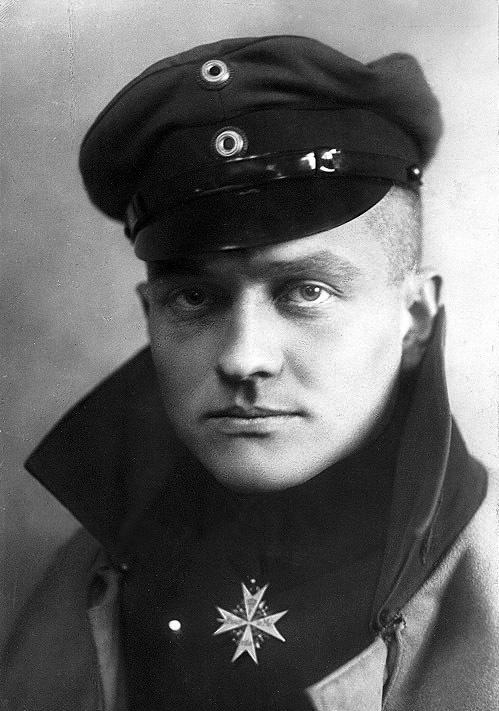 After Manfred reached his 16th kill, and after the death of his mentor Boelcke, Manfred was awarded the famed ‘Blue Max‘ as well as command of the fighter group Jagdstaffel 1, which was put together as a mobile fighter force by Von Richthofen. 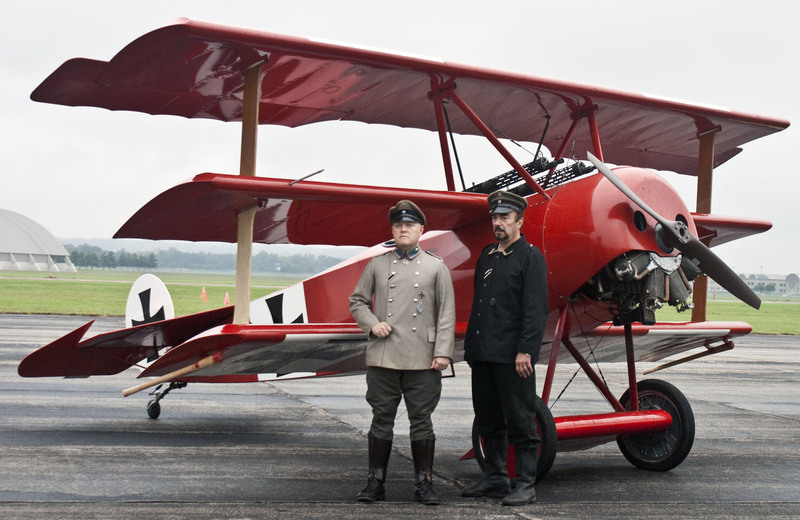 With its ability to quickly move from area to area and Manfred’s desire to have his own men paint their own color schemes, the ‘flying Circus’ moniker stuck, much to the pride of its leader – especially after he took to flying a bright red, Fokker Triplane, which was considered to be a fast, agile, but fragile fighter plane. This being a Master Grade, not much need be said about the material quality. No flaws, no color issues and instructions which are easier to follow than a herd of elephants. I plan to steer clear of my usual grubby mech paint scheme here as Char calls for something a little shinier, him being the Red Comet and all. Most especially as my entry to the World Gunpla Building contest this year (a Quattro Bagina themed Nightingale) was criticized by the judges for not being polished enough for a ‘Char’ mech. However… One does not care to acknowledge the mistakes of one’s youth, so here we go! Gunpla TV – Episode 288 – Frame Arms Genbu & HG Mazinger Z!